The coming of the summer split is heralded by the smell of barbequed careers. The World Championship's now just a scant five months away, and while that might seem a long time to us mere mortals, it's no time at all for teams. The spring split and Mid-Season Invitational took measure of their capabilities—and left the majority of them found wanting, even among the topmost teams. The stink of it this year's been especially intense—Counter Logic Gaming dropping Austin "Link" Shin set off a chain reaction of drama that hasn't yet fully settled down. Similarly, though Cloud 9's Hai Lam stepping back wasn't entirely unexpected due to his decline in strength, the break-up of the long-lasting roster entailed much wailing and gnashing of teeth from its supporters. But the big question for either of them, and all of the teams and regions locking in their rosters for the summer, is "has it helped?" The summer split is a merciless time—their one last chance this year to make it big, leaving no margin for error. The good news is, Europe's out of their rut! Fnatic's breathtakingly aggressive performance back at Tallahassee demonstrated progressive evolution—enough to give SKT T1 a jolting scare, coming within a desperate game to take the best-of-five. The great news is, they're not going to be alone in this. Much of the criticism levied at Europe over the past seasons was their regional timidity—a low-risk approach to play influenced by CLG.EU and characterized by extended laning phases and late-game emphasis. The key exceptions were Gambit Gaming and Fnatic, but the decline of the former thanks to the geographic burdens of the centralized EU LCS circuit meant that most of the trickle-down influences afflicting Europe came from teams that largely didn't know how to close out the game without a monumental gold lead or late-game scaling carries. That's no longer so much a part of the EU metagame fabric, thanks to the efforts of Fnatic, in any of their iterations, and the infusion of fresh blood over the last year. Teams like UOL don't know when to quit, even for their own good, and teamfights churn out for minutes at a time. And the returning veterans from Origen aren't slouches in the high-risk/high-impact play style either—probably not a coincidence that Origen is basically Old Fnatic coming back to show these newcomers what for. 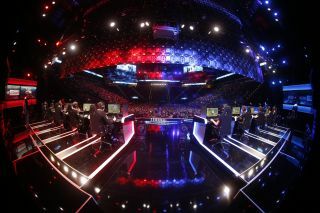 It is a necessary evolution for the scene, not only to keep pace with China and even Korea's aggressive early-game strategies, but because the game has been steadily balanced in favor of their sort of early-game risk management. A combination of the current tank dominance and the scaling-back of AD carries makes late-game oriented farm strategies categorically inferior to those structured around early- and mid-game dives and dragon fights. If they can keep the pace, they should be pretty happy with their odds come October. While the EU is coming out of a passive rut, North America seems to be slipping into one. TSM's disappointing performance at the Mid-Season Invitational highlighted significant deficiencies in the region overall—for instance, their lack of mid lane strength outside of Soren "Bjergsen" Bjerg had an unintended crab-bucket effect highlighted by his inability to make an impact against international teams also known for their mid laners. Simply put, for the last year, Bjergsen hasn't had to fight against anybody that could come within a shadow of his own capabilities. He's forgotten how to be the underdog in a scrap. And TSM's forgotten what it's like to face teams that are actually capable of abusing timing weaknesses and stagnant play. To the chagrin of regional purists, the solution for this probably won't come from within the North American scene. The next-best mid lane talent from spring comes from China's Yu "Xiaoweixiao" Xian, on Team Impulse, or Team Liquid's Kim "Fenix" Jae-hun, from Korea. Cloud 9, in particular, has taken a page out of TSM's own books, scouting abroad in Europe to take advantage of their comparatively greater pool of mid lane talents. Nicolaj "Incarnati0n" Jensen, fresh out of purgatory, is expected to be Bjergsen's peer—a fellow mid laner, a fellow Dane, and anticipated to be a fellow monster upon the North American circuit. That doesn't seem to solve North America's long-term issues, though, or strategic deficit. In particular, the coaching shortfalls dramatically illustrated by Counter Logic Gaming's (latest) descent into madness don't appear to be solved for most of the region's teams—though one would certainly hope that Brandon "SaintVicious" DiMarco's announced retirement from Gravity's lineup is more of a transition into that role, given the job's requisites in authority and experience. It might be some time before North America's Worlds-ready, though—probably not this year, in fact. While it speaks well for them to be willing to retool so heavily, such as with Team 8 dumping the perennially struggling Ainslie "frommaplestreet" Wyllie for Zachary "Nientonsoh" Malhas, the act of retooling at all is something you do in hopes of better long-term growth. In the short term, they're left in an even worse position than they were before, having to rebuild their team identity. All hail the new age of Taiwanese esports! ...kinda. AHQ's Westdoor fulfilled his promise to avenge Yoe Flash Wolves' loss to Team Solomid, and overall rebuffed all doubters that the LoL Master Series deserved their World Championship seeds. The problem is actually winning Worlds, or at least coming into contention for it. Sure, sure. Taiwan now has a 2-1 record against Europe, and have pulled ahead of North America. But while it's a great thing for the region to be so solid against the LCS circuits, the real challenge is against their closer neighbors across the Strait and up north on the peninsula. Frankly, they can't handle Edward Gaming or SKT T1, and don't appear to be capable of doing so anytime soon. The scrim system set up between the coaches network of the three regions has done a lot for the scene, elevating them to a respectable plateau, but it can't solve the smaller player base and poorer infrastructure the LMS is saddled with. They have fewer endemic sponsors to work with, fewer Challengers to recruit and foster, and the banning or retirement of even a single star player can cast doubt upon the region's hopes. And with both Sa "GreenTea" Shang-Ching and Chen "Winds" Peng-Nien retiring this year, my poor region's in for some rough weather. Of course, "retiring" in esports is extremely conditional. GreenTea's "retirement" was crucial to AHQ's current success, as he now fills an analysis and background support role they were severely lacking. And while Winds isn't as closely tied to the Taipei Assassins now, focusing more on streaming (alas), he's still contracted to help them out with training and analysis—not to the same extent as GreenTea, but still better than letting the man that single-handedly taught Taiwan to jungle to simply slip through the cracks. Of course, the only story of any real consequence in the road to worlds is the heated rivalry between China's LPL and Korea's LCK—and, more specifically, the anticipated rematch between Edward Gaming and SKT T1. The Mid-Season Invitational back in Tallahassee, Florida, was the first time in two years that Korea's lost an international tournament they've shown up at, and it's clear that the direct and external causes of that's all at China's feet. Not just by Coach Aaron's unbelievably devious pick-ban strategies neutralizing Faker in crucial games of their now-legendary best-of-five set, but in how China's billionaire scions have neutralized the Korean region as a whole. It should rightfully be upsetting to long-time esports fans that KeSPA's not only failed to invest properly into their world-class teams, but failed further yet to convince any of their expatriated players and coaches to return during the months since the massive 2014 Chinese shopping spree. In fact, China's influences are encroaching even further. Incredible Miracle re-qualifying for Champions Korea isn't too surprising—but they're now sponsored by Chinese company Longzhu. New team Anarchy is, like with GE Tigers, yet another competitor outside of KeSPA's aegis of influence, representing another crack in the defenses of Korea's formerly well-reputed corporatized infrastructure. Is this the end for them? Probably not. Rumors have reached me as to CJ Entus's strengths against even Chinese front-runners, and SKT T1 isn't going to take their loss lying down. But Korea's finding themselves in an interesting position: they may very well be the perceived underdogs versus China come October—a position they haven't experienced since IPL 5. Either way, this will be a historic summer.